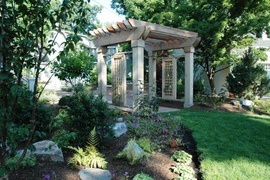 Pergolas are used to form shaded sitting areas or paths. They must be made of weather-resistant material. Common choices are painted or stained redwood or cedar, vinyl, and PVC. Do it yourself kits are available. A 10x10 ft vinyl pergola kit is approximately $1,500. A professionally installed 10x10 ft. cedar pergola cots approximately $3,500. Installations using teak or other high end materials cost around $6,000.